Welcome to VSD community events !! VSDOpen Conference 2018 on 27th October, LIVE !! 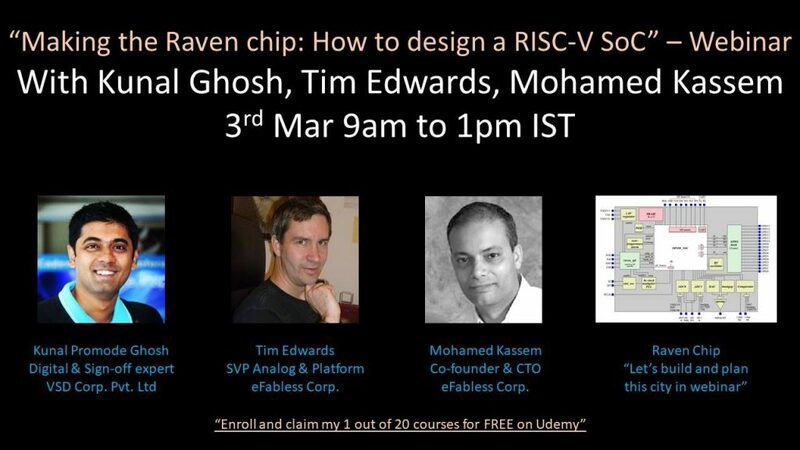 After successful webinar on Making of Raven Chip, this time we take the chip forward and implement using end-to-end opensource EDA tools, and all on efabless cloud. What does this mean to us? 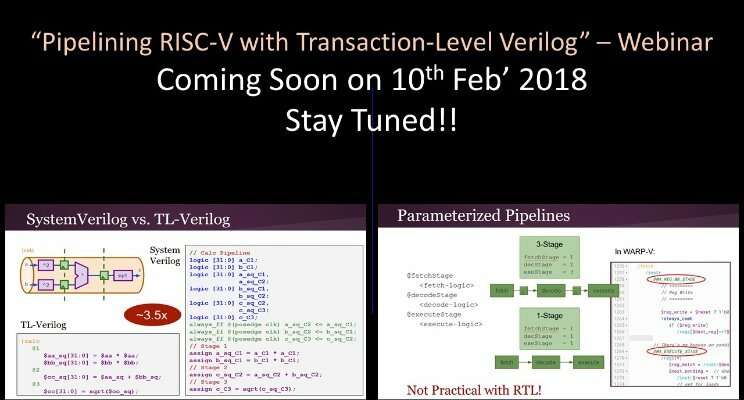 It means, you can start innovating on a design, build RTL and do synth/PD/LVS/DRC all using opensource EDA framework and not pay a single penny for license. The big question How is this possible? Additional requirements: Substrate contacts, antenna tie-downs, etc. Tim Edwards has been doing analog VLSI design and collecting and developing open-source EDA tools for over 25 years. He has worked for the Johns Hopkins Applied Physics Lab, startups MultiGiG (bought by Analog Devices) and most recently, eFabless. He runs the website opencircuitdesign.com, dedicated to open-source EDA software and hosting such tools as magic, qflow, netgen, and xcircuit. Mohamed Kassem is the cofounder and CTO of eFabless corporation. Prior to launching eFabless in 2014, Mohamed held several technical and global leadership positions within TI’s Wireless Business Unit. He joined TI in 2000 at the beginning of the digital telephony revolution fueled by the unprecedented integration of major phone functions on a single SoC. He led the first development of 45nm, 28nm analog & mixed-signal IP functions for wireless applications processors. Mohamed holds a masters degree in electrical engineering from the University of Waterloo, Ontario, Canada. There are multiple places, we can introduce distributed computing to timing and major motivation is to speed up the timing closure. We have to analyze timing under different range of conditions, typically quantified as modes (test mode, functional mode) and corner (PVT). The number of combinations (timing views) you have to run is typically increasing exponentially with lower nodes. That’s where you need to need to distribute timing analyses across different machines. Tsung-Wei Huang is Research Assistant Professor, in Department of Electrical and Computer Engineering at University of Illinois at Urbana-Champaign, IL, USA. He has done his PhD in Electrical and Computer Engineering at UIUC. He holds 2 patents and more than 30 Conference and Journal Paper publications. Recorded Version for people who missed it !! Our next webinar is slightly different one. 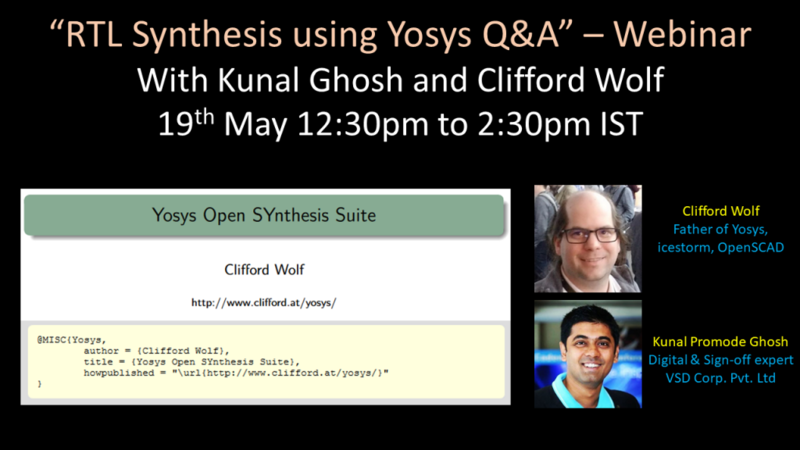 It’s a Q&A webinar on RTL Synthesis, by Clifford Wolf. Clifford is architect of ‘Yosys’ which is a framework for Verilog RTL synthesis. It currently has extensive Verilog-2005 support and provides a basic set of synthesis algorithms for various application domains. Clifford will be answering below 23 queries on RTL synthesis. 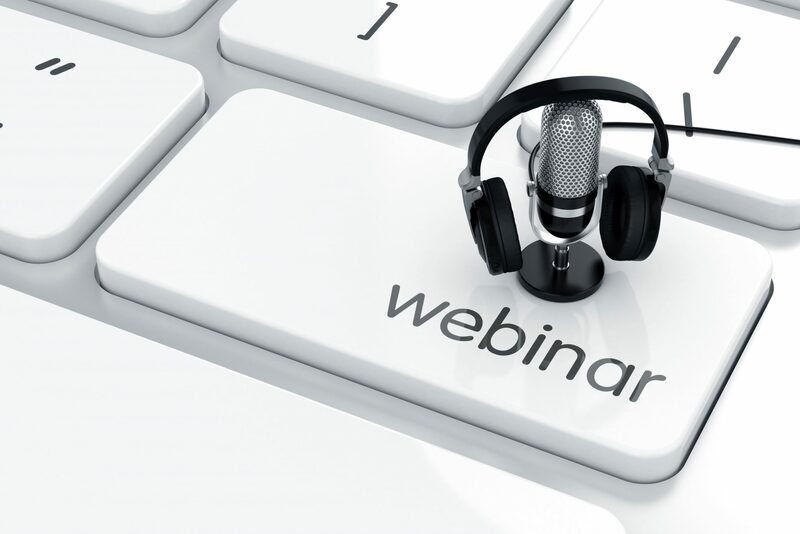 Entry to this 2-hour webinar is FREE, recording is paid. So, buy it, if you like it. This webinar opens 2 new opportunities, one – a chance to interact with architect of Synthesis, two – a chance to get your question in TOP25 list. Since we have already started receiving queries, make sure you draft challenging queries. Below TOP23 query submissions are directly eligible for certificates from our company “VSD Corp. Pvt. Ltd.” All the best and happy learning. Note of Appreciation – I have worked with Clifford in my course on TCL programming Part 1 & 2, and really Thank him for all his guidance for making of TCL programming course. 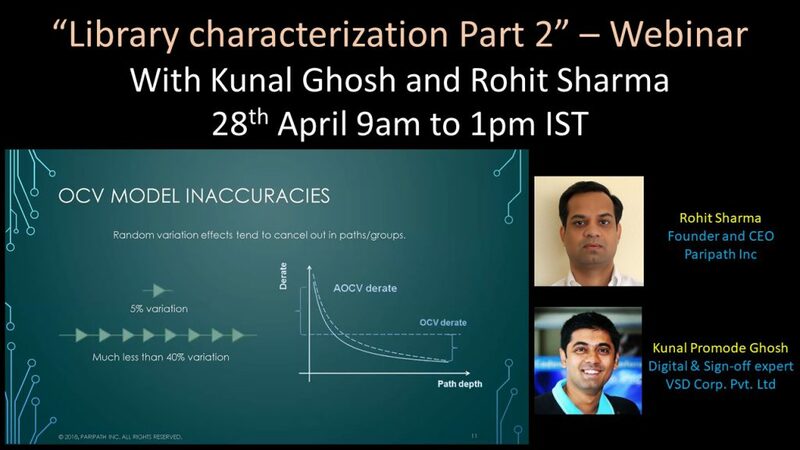 We are going to present “Characterization with GUNA : A characterization tool by Paripath”. We will go through the characterization flows – flows which are popular for standard cells, memories, IP’s. Within that, we will cover timing, noise, power and variation as 4 main topics of the characterization. Each one of those is expected to have a lab, where instructor will run GUNA as a standalone software and generate the models. So lot of exciting thing to be presented, and, the biggest thing about this webinar is the Instructor himself – Rohit Sharma. Rohit Sharma is Founder and CEO of Paripath Inc based in Milpitas, CA. He graduated from IIT Delhi. He has authored 2 books and published several papers in international conferences and journals. He has contributed to electronic design automation domain for over 20 years learning, improvising and designing solutions. He is passionate about many technical topics including Machine Learning, Analysis (above image), Characterization and Modeling, which led him to architect Guna – an advanced characterization software for modern nodes. He currently works for Paripath Inc.
We start with Electronic design automation and what is machine learning. Then we will give overall introduction to categories of machine learning (supervised and unsupervised learning) and go about discussing that a little bit. Then we talk about the frameworks which are available today, like general purpose, big data processing and deep-learning, and which one is suitable for design automation. This is Machine Learning in general with a focus on CAD, EDA and VLSI flows. Then we talk about Applied Theory (data sets, data analysis like data augmentation, exploratory data analysis, normalization, randomization), as to what are the terms and terminologies and what do we do with that, accuracy, how do we develop the algorithm, essentially the things that are required to develop the solution flow, let’s say, you as the company wants to add a feature in your product using machine learning, what you would be doing, and what your flow will look like and this is what is shown as pre-cursor of flight theory as what you should be looking out. And then we start with regression, which is first in supervised learning. In the regression, we will give couple of example, like first is resistance estimation, second is polynomial regression which is capacitance estimation. For resistance estimation, we have the dataset from 20nm technology. And finally, we go on to create a linear classifier using logistic regression. Next will be conditionality reduction, meaning, you have a large dataset and how to you reduce the size of that so that you can run on a laptop or even on your cell phone. Then there is a big example of that. Everything has mathematics behind that, this won’t be a part of the webinar. 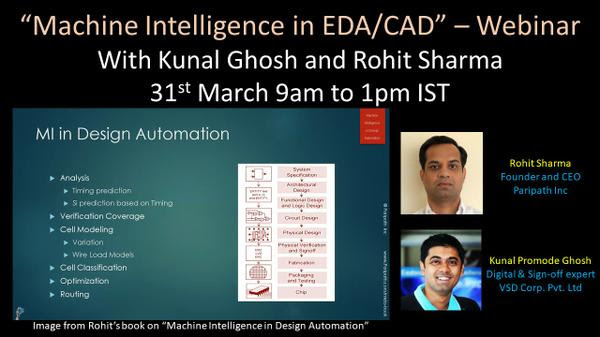 Webinar presents a hands-on approach with session on GPUs, solving design automation problems with modern machine intelligence techniques by including step-by-step development of commercial grade applications including resistance estimation, capacitance estimation, cell classification and others using dataset extracted from designs at 20nm. It walks the reader step by step in building solution flow for EDA problems with Python and Tensorflow. It is organized to serve as a compendium to a beginner, a ready reference to intermediate and source for an expert. Rohit Sharma is Founder and CEO of Paripath Inc based in Milpitas, CA. He graduated from IIT Delhi. He has authored 2 books and published several papers in international conferences and journals. He has contributed to electronic design automation domain for over 20 years learning, improvising and designing solutions. 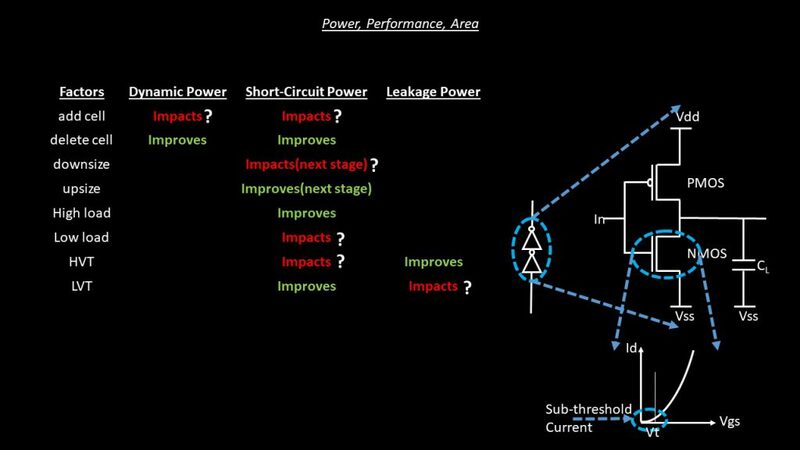 Chip Planning involves lot of decision making like, analog peripheral (ADC, DAC, POR, etc. ), digital peripheral (UART, flash controller), memory mapping, top level connections like pad-frame, level-shifters, GPIO and many more. Do you want to know what it is like to build a city? 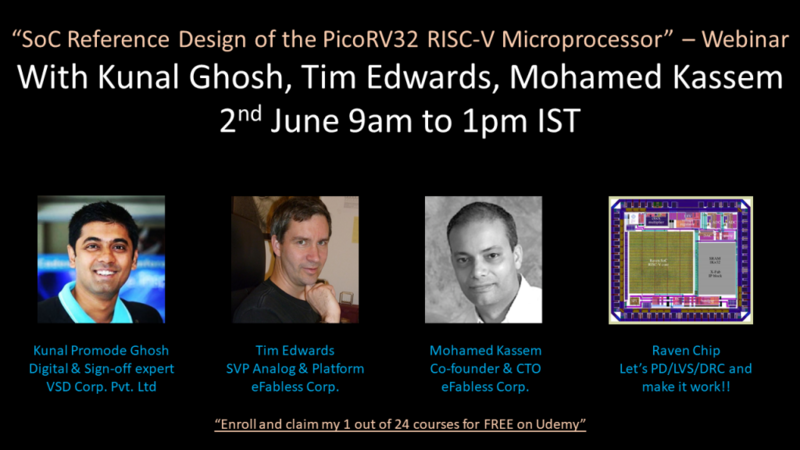 Enroll in webinar on 3rd March from 9am to 1pm IST with myself, Tim Edwards and Mohamed Kassem. Details of registration link will be published soon. This is the perfect webinar for to grow and stay ahead of curve in Semiconductor and Chip design. Example: Create a new testbench to test bandgap voltage and use bandgap as reference to test the comparator. Example: Run the new test bench and verify operation. (E) Control values are the amount to add to the counter per clock cycle and the value at which to toggle the timer output. (G) Continuous mode may restart at zero or wrap around. Pipeline implementation – Which one is better? And Why? Recorded version of Webinar who missed LIVE !! 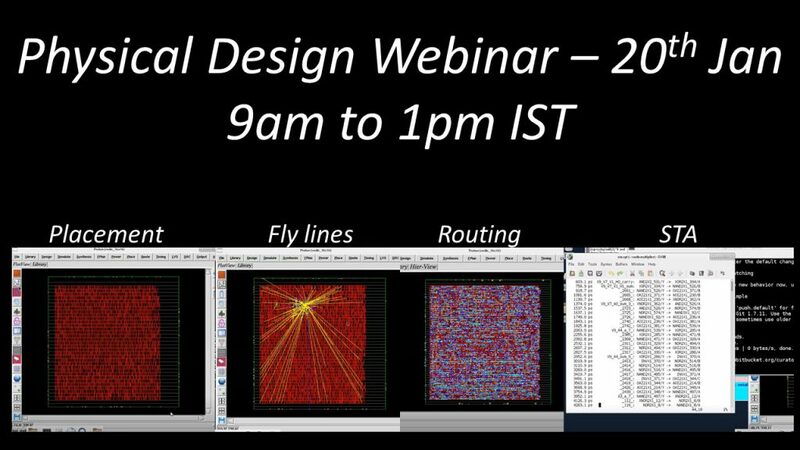 What if I told you, you can design chip without installing any tools on your laptop?What if I told you, you can design chip on cloud, just like Amazon eFPGA?What if I told you, you can design chip for FREE?Don’t believe it…Well, attend my first physical design webinar on 20th Jan, and stay tuned to below link for more updates:This will be first ever webinar, where we will bring in industry EDA expert and EDA tool architect as support, while myself driving the webinarLearning something new is always good, as this might just what will happen in few years from now. (Amazon eFPGA – where you can setup FPGA environment on cloud and run your simulations – has proven that). Something similar will happen for back-end physical designThis year, we will begin with something new in the field of chip design, and let this webinar be the start…Like my all other webinars, expect a humongous discussion and interaction with experts. Recorded version of Webinar for people who missed LIVE !! Highlighting VSD’s technique to use open source tools for performing Static timing analysis leading to innovative design and cost effective solutions for Chip designers.VSD shows the technique to analyze a design using an Opentimer tool, which is used to do block-based analysis, path-based analysis, cppr, incremental timing, and multi-threading. 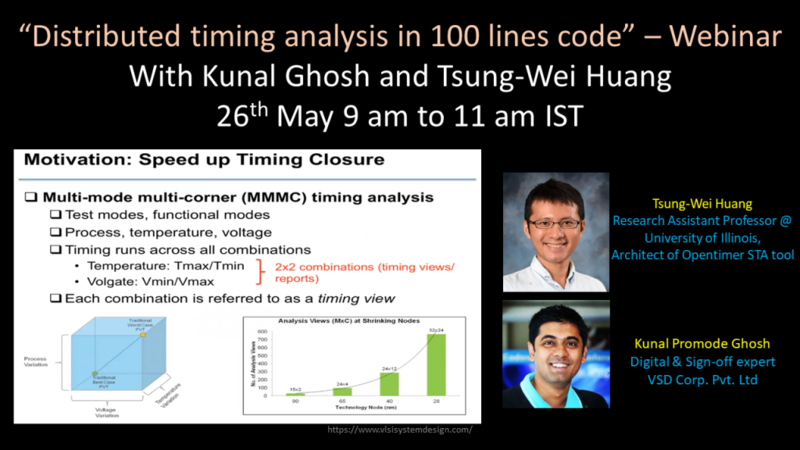 Our methods are extremely fast and accurate to analyze large-scale designs.This webinar highlights the merits of Open source EDA tools to bring innovation in the Chip industry, and will also show our methods to learn & design on your PC and also enables higher performance at zero cost. Let’s begin with Second expert workshop in STA, after completing a full energy packed first workshop filled with freshers, professionals and also expertise in the field.VSD workshops are community events, where like-minded individuals get together, learn, practice and share ideas on what it take to build a design using open source EDA tools, also how to develop productive work culture with highly engaged designers.Following a knowledge ice-breaker and an innovative designing using open source tools, Lets have some more practice session to build a structure and to represent how an energetic community work towards developing a great CHIP DESIGN !! First ever STA workshop using open-source tools in Bangalore!Static Timing Analysis (STA) is used at each stage of physical design. I have been very successful in physical design field at Qualcomm and Cadence, by doing STA first. STA is an art that can help you carefully craft the locations of your logic cells and route them. Do you want to know how it’s done? Welcome to my first ever workshop on STA and I can promise you I will change your perception towards STA and IC design for the good…. Kunal will talk about a novel technique of building open-source hardware community using adaptive and adaptable learning mode with open-source EDA tools. The gap confronted here is shortfall of guidelines and support systems to use these tools, and one architecture that connects complete design to all tools. VSD has been attempting to fill this gap by blending the learning and practicing methods through online video courses with the goal of building a large community across the globe who are designing and innovating using open-source tools. A poster presentation on a complete C to GDS flow using open source tools demonstrated on a multi-million gate design.